We would like to welcome you to the Air Filter Replacement Center web site. We carry 1st stage pre filters, 2nd stage ring panels, 3rd stage general purpose filters, 3rd stage HEPA filters & 4th stage carbon filters. Our staff is here to help you in any way that we can. 100% Customer Satisfaction is our number one priority. So if you are unsure of what product is best for your project call us toll free at 1-800-227-8479. Machine comes with 1 ring panel, 1 HEPA filter, and 1 prefilter. (ready to use). (replacement filters are available from us as well). 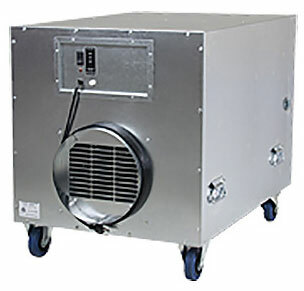 Novatek's negative air machine offers users versatility in that it can handle a wide range of jobs. First and foremost, it is ideal for the mold remediation or cleaning and restoration jobs. 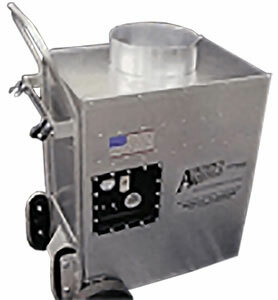 A powerful two horsepower motor provides a consistent flow rate and utilizes all of the filter media area. The motor uses a special eight point motor/cage mount which prevents any motor and cage shifting - "NO MORE RUBBING CAGES". The machine uses standard 24" x 24" Hepa Filters and a positive lock prevents and filter movement to insure complete filtration. The unit operates at 1200 CFM on low setting and 2000 CFM on high setting. 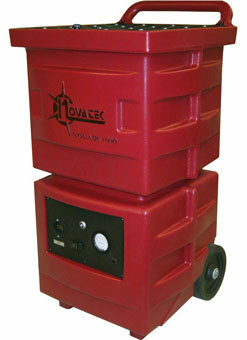 The Novair 2100 is easier to transport as it breaks the 100 Lb. barrier and is the lightest 2000 CFM unit on the market. The cabinet features seamless construction for leaf proof operation. Additionally, there are no worries about rust and corrosion to the cabinet in damp operating conditions typically found in remediation and restoration work. Regular inexpensive dust filters can be used which make the unit ideal for the dust collection service in construction and renovation work such as concrete resurfacing, drywall work or in any area where air filtration to remove excessive dust is required. The Novair 2100 can be used as an air scrubber to remove odors such as might generated by carpet or other flooring mastics, paints and finishes as well as various solvents and cleaners. Activated charcoal filters can be used as an effective means of odor control, especially when remodeling is taking place in office or other areas while they are still occupied. 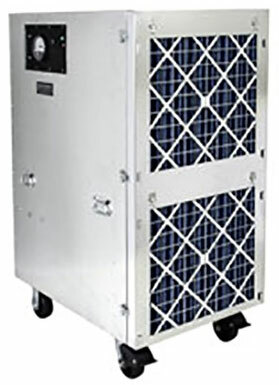 Machine comes with 1 ring panel, 1 HEPA filter, and 1 prefilter and audible & visual alarms. (ready to use). (replacement filters are available from us as well). THIS UNIT COME WITH A GENERAL PURPOSE FILTER INSTEAD OF A HEPA FILTER! Novatek Novair 2100 Negative Air Machine (also known as an air scrubber) comes with 1 ring panel, 1 general purpose filter, and 1 prefilter. (ready to use) (replacement filters are available from us as well). This product is too large to ship via UPS, therefore must be shipped common carrier. Please contact us for a shipping quote. • Portable, and very durable. • Powerful 2 Horse Power motor generates exceptional, consistent flow rate and utilizes all Filter media area. • 8 point motor / cage mounting prevents motor and cage shifting even under the harshest condition. • Seamless construction guarantees leak proof operation. 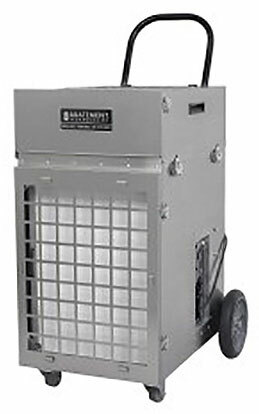 • Lightest 2000 CFM unit on the market breaks the 100 lb barrier and is easily transported by 2 operators. • Positive lock filter prevents filter movement for uninterrupted filtration. • Uses standard 24" x 24" HEPA filters. • 8 point motor / cage mounting prevents motor and cage shifting even under the harshest conditions - "No more Rubbing Cages!" • Uses standard 16" x 16" HEPA filters. THIS UNIT COMES WITH A GENERAL PURPOSE FILTER INSTEAD OF THE HEPA FILTER! • Variable speed controller: 100 C.F.M to 550 C.F.M. 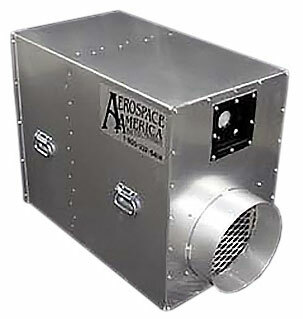 Aerospace America Aeroclean 2000 "Full Feature"
Aerospace America Aeroclean 2000 "Econo"
Aerospace America Aeroclean 1800 "Mighty Might"
This Portable Air Scrubber has an air flow exceeding 2000 C.F.M. 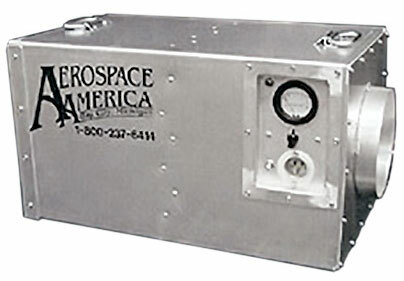 and is ideal for medium or large commercial/industrial projects. The all inclusive Scrubber contains a high powered 1.5 H.P. Motor along with a four (4) stage filtration system. The MS 2000 weighs only 150 pounds and with the built in dolly system, makes it easy to transport to and from the job. 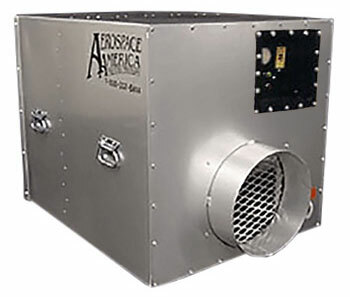 Aerospace America, Inc. has once again kept up with industry demands and has provided contractors with yet another Filtration Machine. The line of Air Scrubbers offered by Aerospace are capable of capturing indoor airborne contaminants such as mold spores, bacteria, dirt, dust and harmful gases. 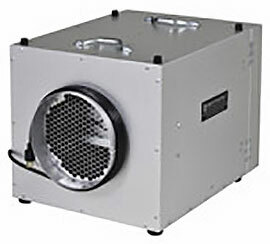 Check with your distributor for other Air Scrubber Models. • Dimensions: (L X W X H) 25" X 24" X 38"
The PAS600 is our lightest (46 lbs.) and smallest model, ideal for especially tight spaces. 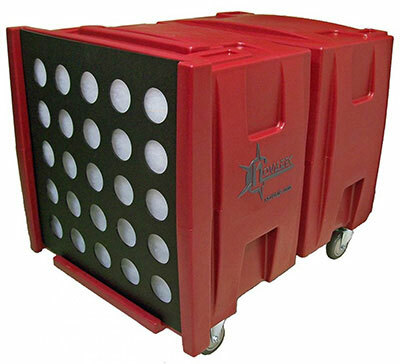 It can either be hand carried via the top carrying handles or used with the optional drop-in cart. • Weight including filter: 46 lbs. • Weight including filter: 85 lbs. 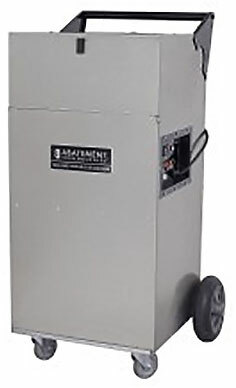 The HEPA-AIRE 2400EK Portable Air Scrubber is an economical and powerful unit producing a tested airflow rate of more than 2,200 cfm. Equipped with a strong 1.75 HP motor, the PAS2400EK transports easily on 12” diameter rubber wheels. The upright PAS2400E Portable Air Scrubber offers contractors a practical and productive option, at an affordable price. • Weight including filter: 148 lbs. The popular H2000L-PAS "contractors" model is designed to provide the budget-conscious user with a more basic alternative to the full-feature H2000LA. This two-speed model delivers the same superior airflow, but with fewer "bells and whistles". The H2000LA-PAS is designed for the user who wants the very best in performance, reliability and quality. The H2000LA provides a full range of features and safeguards such as continuous filter loading monitoring, with audio and visual filter change alarms. This incredibly powerful model is designed to reduce the number of machines needed on large commercial projects. 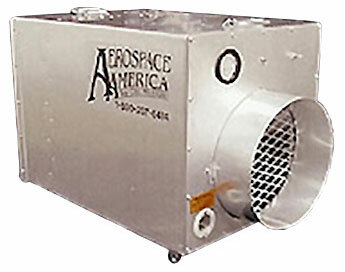 Its 220 volt, 5-hp motor, and multi-inlet blower can produce over 4,000 cfm. A 50-hertz model (H5000TF) is also available.